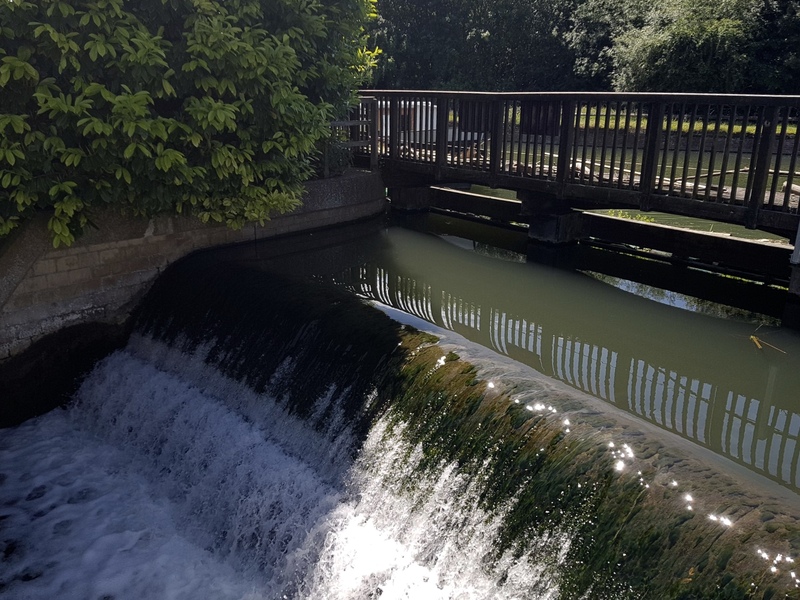 water and the soul – MostlyAboutBeer……..
Adam Mann crossed over the bridge from Ware to rejoin the track along the Lea navigation back to Hertford. The lock gates opened and thousands of gallons of water erupted through them. From this charge, cold air buffeted up towards him like exasperated breath. The water didn’t just hit the turbid surface of the lower pound, but stabbed him in the small of the bladder like a paring knife cutting through melon flesh to the rind. Maimed, he crossed the footbridge urgently – looking up and down the towpath – gauging the distance and time between him and distant walkers to determine whether he had enough precious seconds to himself. When he was able to obscure himself in the bosom of the hedge, he stood taut, raised his head and gave thanks to the gods as his own carnal chamber emptied into the undergrowth. Euphoria followed this unburdoning. Steam curled up – a grateful spirit. We feel what the water feels. We are it. And though we control its path and manipulate its currents, it dictates us back. He once crossed the Grand Union Canal in Marsworth, Buckinghamshire and looked over the rail and noticed there was a slow ebb – the water was being drawn under the bridge. But when he leant over on the way back, the flow was instead being ejected. He wondered how that was possible without a tide. There’s a simple reason: it’s because locks allow boats to travel up and downhill. Water emptying into a stretch causes a knock-on current and water being “sucked” back to fill a lock chamber pulls it the other way again – a whimsical traffic-driven tide of sorts. Water can be held against its will. 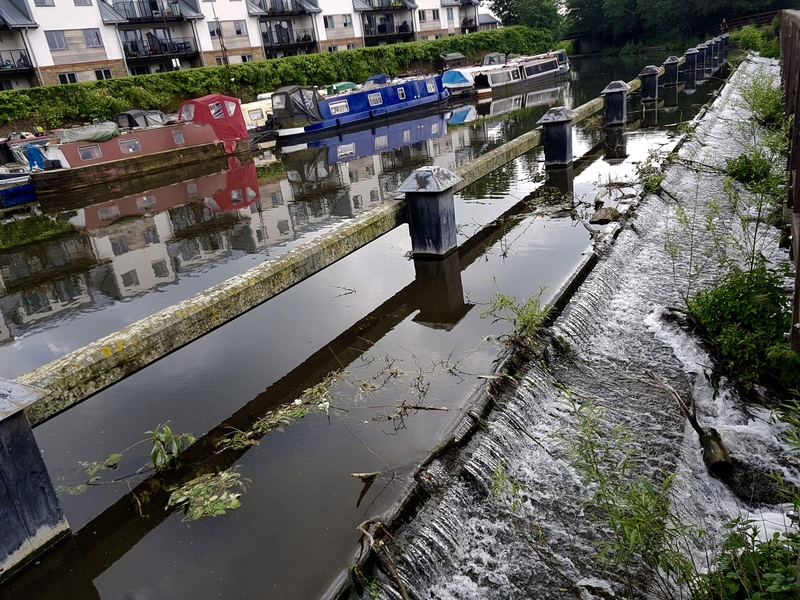 He’s sat transfixed along the same canal network – this time in Hertfordshire – watching a boat navigate through a lock. It takes some time. The broiling water rises underneath the vessel – barricaded in by stout wooden battens. Rogue threads of water spurt through the cracks from the pressure. Once opened, it’s liberated. The boat’s hull clears the cill and only then can this dyad move on. The build-up and eventual release – both for the waters and its keeper – are the essence of psychotherapy; what accumulates first needs containment and then to be set free. When water’s movement is halted, issues gather, at least to Adam. He’d witnessed this in a woodland setting, stumbling across a river that had been led astray. In the gloom, it had been tricked into forming a dead leg. The flow had slowed to an ooze. An oil-like rainbow patina could be discerned. Trapped water develops anxiety – thought is constipated. No current cleanses it or sends the thickening layer of debris on its way. 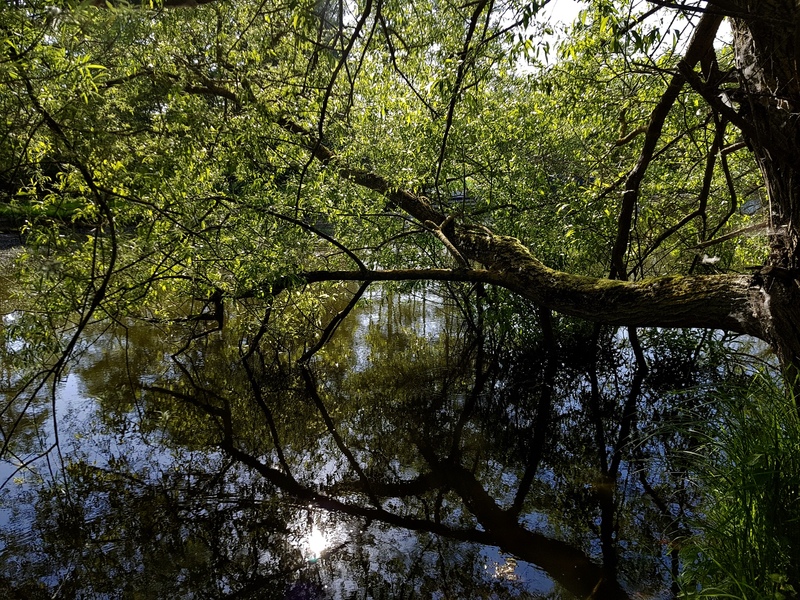 Caught in the cross beams of sheave-light from the trees’ canopy, motes and spores descended like plankton in the glowing blades to settle on the water’s surface and further suffocate it. Petrichor – the wonderful smell of wet re-animation after rainfall – didn’t penetrate these depths. Neither did birdsong. The air didn’t rise out to refresh the enclosure. As if in acceptance that its spirit was broken, it turned in on itself. Introspection turned to depression. The stagnant pool became foul. From the murk came the stench of self-neglect – foetid decay assaulted Adam’s nostrils. Its guts swollen, it choked on itself and the microfauna that once fought for survival in its animus now had free reign to parasitise its body and instead gloat. He wished he could’ve delved his fingers deep into the landscape and carve out a channel to connect it to the nearest watercourse – ease its burden and let it get over its self-pity. Canal water is both constrained and confused. The surface moves with doubt, unlike the river, it isn’t free. The movement would be hard to see at all if it wasn’t for the leaves caught on the surface. The flotsam moves like time-lapse footage of the night sky. When it rains, the entire body seems to pause under the boiling of shimmering rings – a regrouping of disparate waters before resuming their slow advance – whichever way the locks determine that is. At Lemsford Springs, another footbridge crosses the Lea. 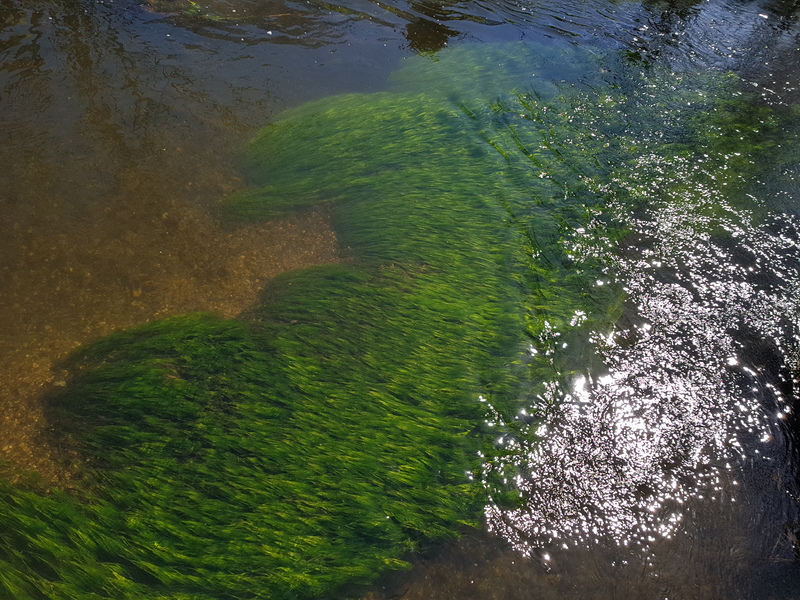 Under the surface, aquatic green hair sways to a silent music – these locks are from wild ranunculus (water crowsfoot) and meakin (water milfoil). Ophelia by Sir John Everett Millais hangs in the Tate Britain and shows Shakespeare’s Danish queen half-immersed in a water course such as this. Her dress billows – her palms supplicate the sky. The riverine flora is well depicted including field rose, reeds, nettles, the white flowers of water crowfoot and the ever-bowing willow. They’re all lovingly rendered. You wonder whether willows started out as other trees, or even humans, but became seduced over time. Gradually they droop, drawn to themselves like Narcissus. The fronds and tendrils lower to the surface and immerse themselves. Like us, they seek contemplation and find it in the shimmer of the river’s eye. Unlike us, they form perfect interstices of geometric art. Ophelia is actually meant to be singing in the painting but it looks like submission, as if she’s resigned to dissolve silently into the brook – freed from the world’s tribulations. 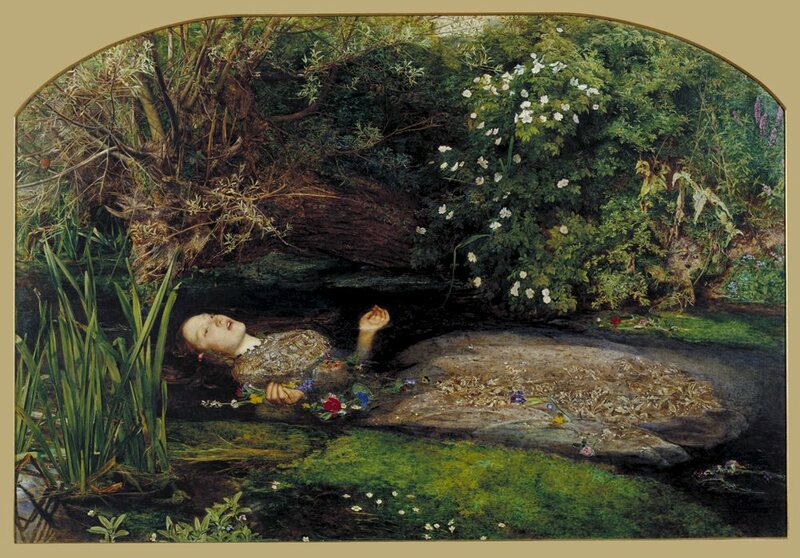 Even in summer, Ophelia’s model – Elizabeth Siddal – would’ve caught her death from hypothermia. To this end, the background was painted before her portrait was. To look realistic, Elizabeth posed floating in a bathtub heated by a corona of oil lamps – this wasn’t the Hogsmill River in Surrey where the river was put to canvas, but in a flat just off Tottenham Court Road. 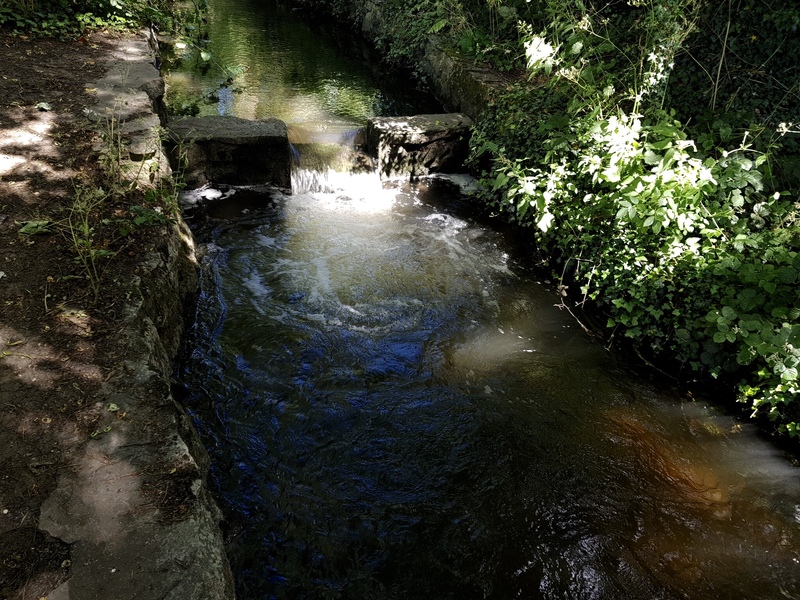 Her expression and outlook represent what each of us has imagined on a summer’s day when seeing those undulating manes under the surface of flowing water: to wade straight in, turn on your heel, lie down and be soothed by the current washing over you. Bronwen Fenyw suffers from intense stress-related headaches. When they come, the occipital muscles that circle her head above her eyes, via her temples and to the back of her skull tense up. It’s like a taut bandana has been wrapped around and tightened by turns of a screw. The release seems to be above the nape of her neck – causing her to tilt her head back just like Ophelia, to ape the verdant manes of ranunculus or water milfoil and let her hair get cleansed in the cool slipstream. Bodily relief can be achieved psychologically. For her, hearing the whin and gurgle of a hidden stream is like putting a hand to the chest to find a pulse. The words channel and canal both derive from the same fifteenth century French word for a pipe which could equally describe the human internal system: we easily imprint ourselves on the live waterways because we have alimentary canals for the short term, and circulation – life’s blood – for the long. We project onto water a will and a journey – whether it be battering the coastline – or trickling its way through burns, ditches and rivers back towards the vastness of the sea which we have a special relationship with. Its character is framed in an even wider context. On Anglesey (Ynys Môn), the mood across the Irish sea is capricious. The waves are a distant sequence of eliding mountains where gannets plunge from the vault like darts and disappear as white pockmarks in the immutable swells. At Studland in Dorset, the sea turns an emerald green, rising with the Jurassic coast into a standing ovation. Therein lie the sun-bleached memories of childhood camping holidays. The north Norfolk coastline is a moody teen – at the same time vulnerable and treacherous – local and psychologically unstable. Meeting up with the sea forces deep reflection each time. We have a notion of the gone, the ephemeral present and the pregnant future. And maybe the ocean acts like a whitewash on the mind – wiping it clean from its trivial excavations. We see our own lifeline and the exact point we are at now as thousands of ancestors – now long dead – also did. And just like the riverine spirit snaking its way back towards the sea, we shall soon be joining the unseen mass of those departed. Might the reassurance of having the sea in our sight be some evolutionary vestige from a time in our past. An age when we had started to come ashore, but needed to keep the water within reach so as not to perish in the dry atmosphere – hence why this feeling of reflection and steadfastness still prevails. 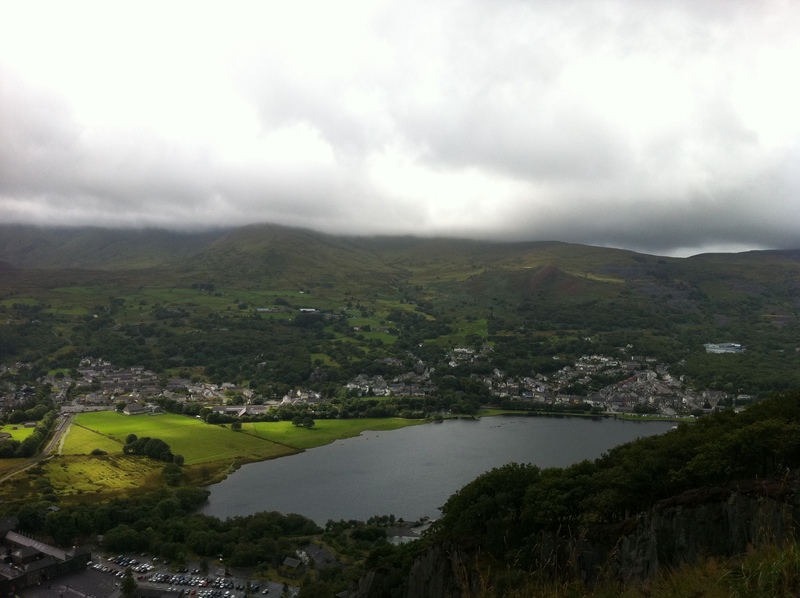 I was raised in Llanberis in north Wales. Just outside this small ex-mining town is a cluster of lagoons sunk among slate beds. 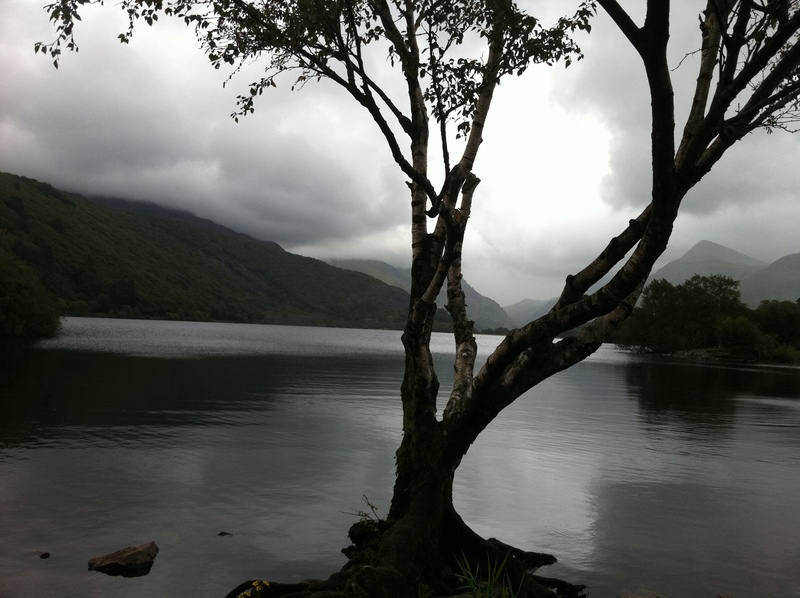 They satellite Padarn Lake (Llyn Padarn) – a body of water that has endured since the last ice age. These glacial pools act as eyes perusing the sky; each tarn a glazed iris. The path of creeping clouds can be traced across them. They were intensely personal. Even then, I didn’t like others invading what I deemed to be my space. The apparently lifeless waters weren’t completely still – there was movement in the depths like a dreamer rolling over in sleep. The slumber felt ancient. When you inspect a lagoon at close quarters, like the willow, you contemplate yourself in the reflection – you have little choice. The slate is layered with a quilt of green algae. As you step in, it’s akin to treading on wet velvet. Initially muted by numbness, the cold then interacts with you personally. Once the level comes up between your waist and your heart, it seeks your counsel. You have the choice of whether to stay untested, virginal – or to go beyond. This is where you must let yourself be immersed in order to entreat back with nature. A solid dialogue needs to be had. Water represents the limen between cosseted life and the bracing grip of nature. When you yield to it, you awaken fully. Floodgates open into you and bring you to the fore of sensation. This is the seal that is breached. Your core will be ignited for the first time and blaze like a hearth, feeling in the truest sense. I remember roiling bubbles that gossiped around me as I performed sub-aquatic rolls. I saw the distortion of shape and distance under the surface. I recall the taste of it – it would remain forever inside my head like larval galleries in oak – a mix of mineral and vegetal. I imagine I’m back in Llanber on summer days like this. I gaze at the sky as my body floats. My ears are coastal coves belching with the crunch and gurgle of lapping water. My breath is a gale sucking in and out of my mind’s foothills. 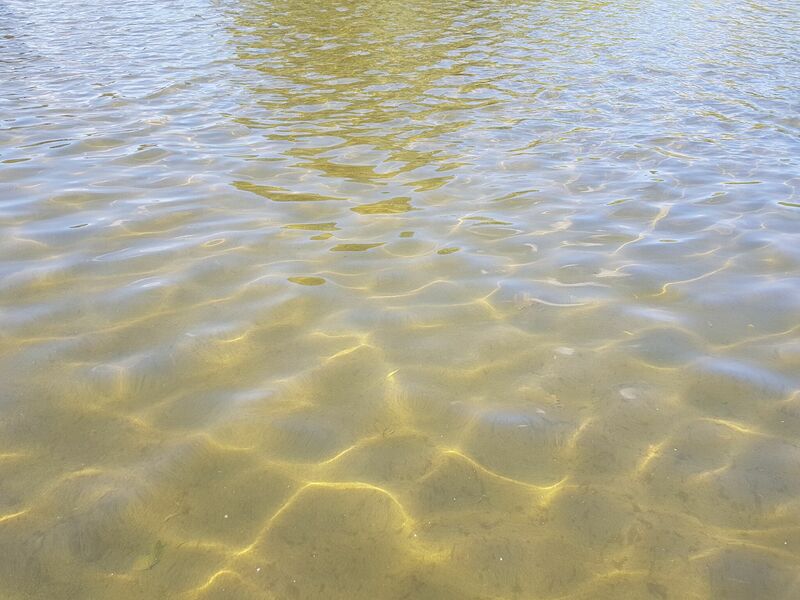 I’m buoyed up – my torso thrust uppermost to make me arch backwards and now I’m part of the water, but also as a sprig drifting on the surface. Above, through the echoes of my own breath, I watch an alien heaven disconnected from this world – it quivers – rocked by my own respiration and the lilting of the pool. I shut my eyes and a red galaxy is stencilled across my eyelids bedecked with burning stars – some go supernova as the sun breaks through cloudcover and suddenly I’m Adam Mann, Bronwen Fenyw, Ophelia. I’m Tom Gill under Glen Mary Bridge, the Chess coursing through Sarratt, the Grand Union Canal in Berkhamsted, the Ver glimmering under St Michael’s, the glowing straits under Menai. I’m the mighty Thames shoulder-barging the columns of London Bridge as hundreds of workers cross above with their heads bowed and the cascade of Ladore Falls as it crashes into the shaded baths on the banks of Derwentwater. These waters are my soma, viscera and psyche and the stuff that binds them. A young boy emerged dripping from the lagoon decades ago exhilarated. Every pore sighed – beaming from the affirmation of life. The experience and the sensation would stay with him for the rest of his days.